I suspect that anyone who does not entirely hate their parents, or even anyone who feels close to those who are edging towards or having a brush with death, will find this book powerful. Certainly the ending of it, at the very least. I’m not sure how much of the emotional content of this book comes from my own experience with coming to terms with death and dying, how much of it is simply me empathizing with the characters, and how much of it is inherent to the material. One way or another, I continue to be impressed by the regularity with which Duane is able to write accessibly emotional and intense material. Ok, there’re going to be some *SPOILERS* here, because I want to talk about the end of the book. I’m pleased as punch about the line of argument / line of reasoning that Nita’s mom takes when facing the Lone Power. Her statements of self-ownership, and calling the Lone Power out on its sense of entitlement with regards to her body, are like a breath of fresh air. This is exactly the kind of thing that I want kids to be reading and internalizing. This is mostly unrelated, but it’s especially refreshing to see these statements shown in such a positive light after having just watched John Wick the night before; that movie is a brilliant display of stunt and fight choreography and performance, something I love due to my own experience with same, but it is a terrible (i.e. it instills terror) view of the patriarchy in action. I doubt you’ll have the same experience of watching John Wick and then finishing The Wizard’s Dilemma, but their juxtaposition makes their differences all the more visible and highlighted the novel’s excellence for me. In conclusion? This is a damn fine book, and my troubling delays in reading it probably had more to do with me than with the novel. You’d be silly to pass it up without checking it out, though I basically feel that way about the whole Young Wizards series at this point. And, let’s be honest, you might be thrown for a loop trying to start here without reading the rest of them, so don’t even try. Start with So You Want To Be A Wizard. You can find my thoughts on it right here. 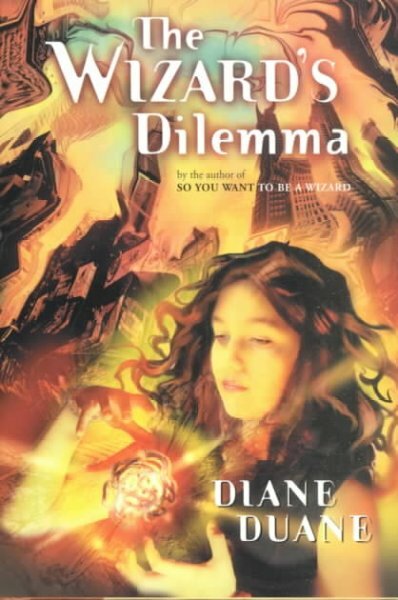 This entry was posted in Books and tagged Adventure, cancer, children's literature, death, Diane Duane, dying, magic, parents, The Wizard's Dilemma, wizards, YA, Young Wizards series. Bookmark the permalink.